41% of registered voters support Trump’s tariffs, according to a Morning Consult/Politico poll. 35% said they oppose the measures. A plurality of voters support President Donald Trump’s announcement that he is imposing 25 percent tariffs on steel imports and 10 percent on aluminum imports, a new Morning Consult/Politico poll shows. But a majority said the moves are likely to trigger a trade war between the United States and foreign countries. 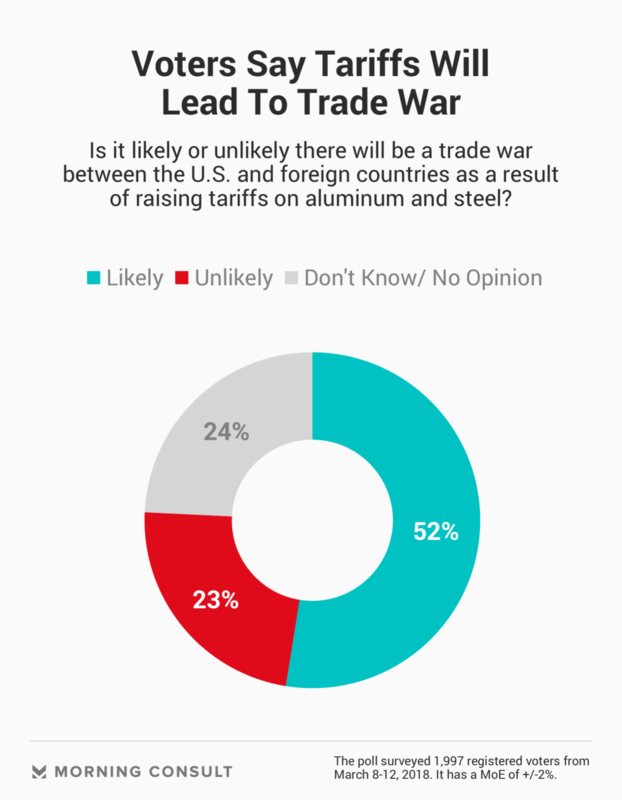 The poll – conducted March 8-12 – found 41 percent of voters support Trump’s tariffs, which the president and levy proponents contend are a necessary counterweight to unfair trade practices by China and other major trading partners. Thirty-five percent said they oppose the measures. Critics have decried the tariffs as counterproductive protectionism that will result in price hikes on a variety of products and destabilize the international trading system. The overall poll, which surveyed 1,997 registered voters, has a margin of error of plus or minus 2 percentage points. 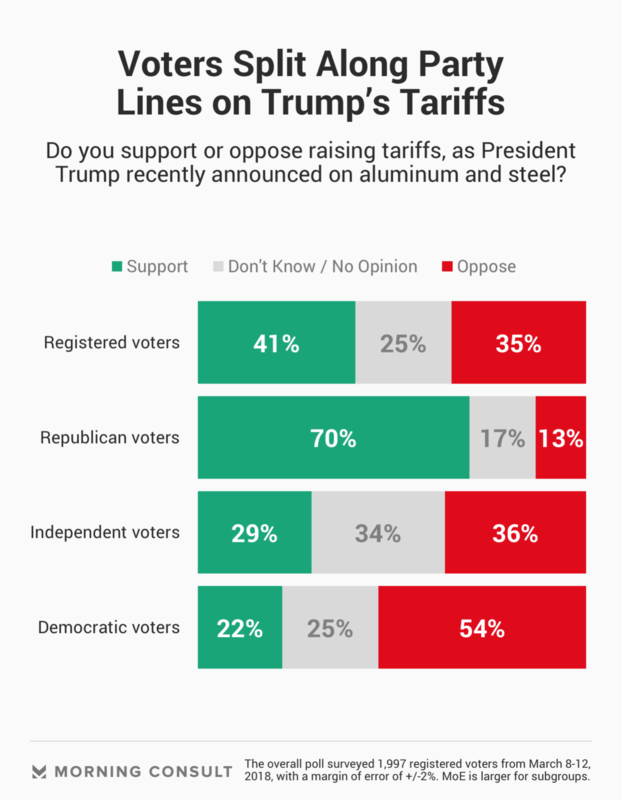 Despite criticism from other industries and among some Republicans on Capitol Hill, tariffs are backed by 64 percent of Republican voters who are not told Trump supports the measures, the poll shows. When Republicans are told of Trump’s support, that number jumps to 70 percent. The two questions – one mentioning Trump and the other not – were asked of smaller samples of voters (1,013 and 984, respectively). The margin of error is larger for subgroups. Fifty-four percent of Democrats oppose the tariffs, both when Trump is mentioned and when he is not. But support among Democrats drops from 25 percent to 22 percent when Trump is mentioned. Still, Trump’s trade policy priorities echo what some Democratic lawmakers have advocated for decades. Rep. Tim Ryan of Ohio, a Democrat from the Youngstown area, said in a Monday phone interview that although he believes tariffs are an appropriate way to address trade issues with China, he’s worried the Trump administration lacks a comprehensive strategy to avoid an escalated trade conflict with other countries. Ryan said he believes Democrats should still be able to argue to blue-collar voters from states such as his that Trump is “not a worker-friendly president,” despite the president’s action to protect heavy industry. The poll found Trump’s support for tariffs had a bigger impact in Ryan’s part of the country than in other regions nationwide. Forty-five percent of voters in the Midwest opposed the tariffs, while 32 percent supported them, when Trump’s support was not mentioned. When Trump’s support was mentioned, 40 percent of voters in the Midwest supported them, while 32 percent opposed them. “I think there is always a very good possibility that this president will go too far on a lot of things, including trying to start a trade war,” Ryan said. Fifty-two percent of all voters surveyed in the recent poll said there will likely be a trade war because of the tariffs, while 24 percent said they did not know or had no opinion. Another 23 percent said they did not think there would likely be a trade war. A 46 percent plurality of Republicans said a trade war was likely, as did 63 percent of Democrats. Rep. Erik Paulsen (R-Minn.), who represents a swing district in the Minneapolis suburbs, said in a Monday phone interview that he’s concerned the new duties will “backfire” due to the possibility of trade retaliation from other countries. His district, where he says much of the economy is trade-dependent, is largely composed of white collar workers: The U.S. Census Bureau estimates that approximately 73 percent of the 3rd Congressional District’s civilian population is employed in management, business, science, arts, sales or office occupations. Paulsen, a member of the House Ways and Means Committee, said his home state weathered the last recession better than others because of the strength of its export economy, and added that he thinks the duties could impact voters in his district who could be paying for the downstream economic effects — such as higher prices for cars and beer. Clarification: Trump has ordered tariffs on steel and aluminum imports, and those are new tariffs for the commodities.